07 Jun 2009 ~ read. There’s trouble in Corus: a large influx of counterfeit coins, combined with rumors of a bad rye harvest, threaten the economy and well-being of the city. As prices rise, there’s rioting in the streets, and something has to be done. Beka Cooper has been reunited with her mentors, senior Dogs Goodwin and Tunstall, after a bad run of partners. When the Dogs discover that the counterfeit coins are coming from Port Caynn, and Tunstall is laid up with an injury, Beka and Goodwin, accompanied by Beka’s new scent hound, Achoo, and the pigeon Slapper, are sent to Port Caynn to investigate. With a cover story and some fortunate connections, Beka and Goodwin infiltrate the gambling dens of Port Caynn’s underworld. The situation in Port Caynn is even worse than they anticipated: a small-minded Rogue who cares more for herself than her own people, a government official who has traded integrity for safety, and a plot that could destroy the land. Meanwhile, Beka finds herself increasingly attracted to a dashing gambler, not knowing if she can trust him. Before long, Beka is on the run, in danger from all sides. Can she uncover the evidence she needs and find a way to stop the plot, when it seems as if the entire city is out to get her? Who knew that counterfeiting could be so exciting? 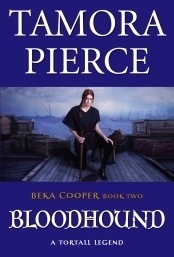 Bloodhound is a worthy successor to Terrier; it’s a well-paced story peopled with interesting characters, from a crotchety but likable elderly silversmith, to a police Sergeant that Beka knew as a child and his companion, a man who sings as a woman in the gambling dens. Beka herself is one of the best characters I’ve ever encountered in fantasy. Her combination of shyness and toughness makes her quite appealing. Beka has grown and matured since the last book, as good characters should; her shyness is less pronounced, and she’s grown in confidence. Yet she still retains an impulsivity that has a tendency to get her in trouble. I had only one complaint about this book, and that was a scene that took place in a medieval-style torture chamber, in which a prisoner was being interrogated with what was essentially a form of waterboarding. This was such an obvious political statement that it yanked me right out of the story. Certainly writers should write about the things they feel passionate about, and fiction can be a powerful force for social change, but in this case I felt that it was too overtly a political statement and interrupted the flow of the story. Overall, though, I quite enjoyed Bloodhound. Rosto shippers will be disappointed that there’s not much of Rosto in this book, but Beka’s romantic interest here, bank courier Dale, is quite attractive and there’s quite a bit of zing between the two of them. I think that Bloodhound stands pretty well alone, and you could read it without having read Terrier. However, reading Terrier first would make it a more enjoyable experience.